There are two ways to perform tree removal: the easy way, or the hard way. If you’re considering pulling out a tree by yourself, just take a look at a video or two of amateurs trying to remove trees from their property. You’ll see broken tow ropes, trees flying through windows, and trees falling on homes. It’s simply a job that should be left to professionals. Here at JRP Tree & Demolition we make tree removal as easy as possible for our clients, from the minute they pick up the phone to the moment we clean up and head out after removing your tree. We strive to provide service quickly, and we’ll work around your schedule so that you still have access to your home while we’re removing your tree. Now let’s delve into the details. Here’s more information on when you should move your tree, our emergency tree services, and why you should leave tree removal to the professionals. When Is It Time to Remove Your Tree? We find that our clients count on us for tree removal for a variety of reasons, including all of the following — if you’re considering tree removal, but your not sure if that’s the best option for your tree, don’t hesitate to reach out to us, we can stop by and consult you based on the current condition of the tree that you’re thinking about. For your view: If you have an obstructed view, we can remove trees on your property to give you the perfect vantage point. Trees have a knack for growing in front of our windows, over our patios, and, well, anywhere that can be inconvenient. If you cherish various views throughout your property, we can ensure that you keep those picturesque panoramas. Storm-damaged trees: A big storm can destroy any number of trees on your property. Hail can tear through leaves and limbs. Lightning can kill a tree in an instant. And wind can blow over even the largest trees. When the worst strikes, we’re here to help. We’ll get rid of any trees that have been damaged in recent storms, and we can provide advice if you’re uncertain whether or not your tree could survive — we’re trained and certified arborists, and we’ll be able to determine the likelihood of your tree’s survival. Cracked, splitting, or unhealthy trunks: The trunk of your tree is its heart. If you have a tree with an unhealthy trunk, it’s likely beyond saving. We’ll take a look at your tree trunk, and remove your tree if it can’t be saved. Unhealthy trunks can be cracked, discolored, dry, missing bark, or infested with pests. Leaning tree: If you have a leaning tree, it should be braced or cut down, since it’s liable to fall. Trees can start leaning if they’re planted in poor soil, or if they’ve been pushed over by a storm. Trees can also lean if they’ve been pushed over by another tree, or if they are imbalanced. Often, trees can become imbalanced if they’re improperly trimmed, so be sure to hire a professional for tree trimming services as well. Trees with root rot: If you have a tree with unhealthy roots, it turns into a risk. Roots can succumb to damage caused by infestations, mold, and poor soil. You may also be overwatering your roots, which can lead to soil problems and rotting. In any case, we can pull out trees on your property if they’re suffering from root rot or weak roots. Overgrown trees: If you have a tree that’s grown beyond its boundaries, or if you have a tree that is old and reaching the end of its life, then we can remove it. Overgrown trees can be especially difficult to remove, due to their size and, often, due to their proximity to homes and other buildings. Fortunately, we make tree removal easy, even for the largest trees. We’ll tie off large limbs, cutting and lowering them so that there’s no danger of damage. Trees on land that needs to be cleared: Clearing your whole lot may seem daunting, especially if you have a small forest on the property. Again, we make tree removal easy, even if you’re pulling down dozens of them. We utilize heavy machinery, including bulldozers and front-end loaders, to make even the most demanding jobs quick. Plus, we provide lot grading services in addition to our lot clearing services, so your property can be perfectly prepared for your next project. Tree removal can be downright dangerous, even with smaller trees. Here at JRP Tree & Demolition, we’re tree removal experts, and we have over three decades of experience pulling trees from the ground. With larger trees, we utilize the right tools for the job, including cherry pickers, chainsaws, hand saws, harnesses, ropes, ladders, and a litany of other tools to ensure that your tree comes down safely — you can learn more about our equipment below. Also, we’ll ensure that you obtain the proper permits for tree removal if they’re necessary. We know the local law here in Houston, and we can help you to gain a permit if you have to remove trees or clear your lot with a permit. Sometimes, trees topple, leaving your property damaged or at risk of damage. When the worst happens, we’re here to help. We provide emergency tree removal services throughout Houston, so that you can get back to living your life after Mother Nature strikes. Call on us for tree removal services, we’ll help you as soon as we can. When it comes to tree removal, equipment counts. Here at JRP Tree & Demolition, we bring all the right equipment, to make your tree removal a snap. We utilize a variety of tools, ranging from hand saws to chainsaws, as well as machinery ranging from front-end loaders to cherry pickers. Depending on the size of your tree, we may have to dig to remove the roots of your tree, or we may be able to utilize our stump grinder to grind down the remaining stump to below grade. We also come to every site with all of the safety equipment we need to keep our employees and your property safe. When it comes to lopping off branches that are soaring 50 feet in the air, we’ll ensure that they’re tied off and lowered to the ground safely. We utilize tree climbing systems, including harnesses, ropes, and other safety gear that’s specifically designed for tree trimming and removal. Our equipment ensures that your tree removal is swift, as well as safe. 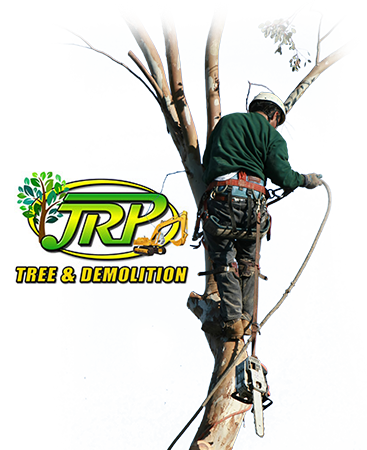 JRP Tree & Demolition is Houston’s trusted, local source for tree care services. We have three decades in the business, and our team consists of trained and certified arborists — we’re members of the International Society of Arboriculture (ISA), which, simply put, means that we know trees. We’ll do our utmost to make the most of your property, whether that means removing trees, planting trees, or caring for your trees. If you’re ready to get started, don’t hesitate to get in touch with us for a free quote!